The US Surgeon General has stated, "Smoking cessation (stopping smoking) represents the single most important step that smokers can take to enhance the length and quality of their lives." Quitting smoking is not easy, but it can be done. To have the best chance of quitting successfully, you need to know what you're up against, what your options are, and where to go for help. This document is intended to provide you with this information. Mark Twain said, "Quitting smoking is easy. I've done it a thousand times." Maybe you've tried to quit too. Why is quitting and staying quit hard for so many people? The answer is nicotine. Nicotine is a drug found naturally in tobacco. It is highly addictive - as addictive as heroin and cocaine. Over time, the body becomes physically and psychologically dependent on nicotine. Studies have shown that smokers must overcome both of these to be successful at quitting and staying quit. When smoke is inhaled, nicotine is carried deep into the lungs, where it is absorbed quickly into the bloodstream and carried throughout the body. Nicotine affects many parts of the body, including your heart and blood vessels, your hormonal system, your metabolism, and your brain. Nicotine can be found in breast milk and in cervix mucous secretions of smokers. During pregnancy, nicotine freely crosses the placenta and has been found in amniotic fluid and the umbilical cord blood of newborn infants. Several different factors can affect the rate of metabolism and excretion of nicotine. In general, a regular smoker will have nicotine or its by-products present in the body for about 3 to 4 days after stopping. Nicotine produces pleasurable feelings that make the smoker want to smoke more. It also acts as a depressant by interfering with the flow of information between nerve cells. As the nervous system adapts to nicotine, smokers tend to increase the number of cigarettes they smoke, and hence the amount of nicotine in their blood. After a while, the smoker develops a tolerance to the drug, which leads to an increase in smoking over time. Eventually, the smoker reaches a certain nicotine level and then smokes to maintain this level of nicotine. 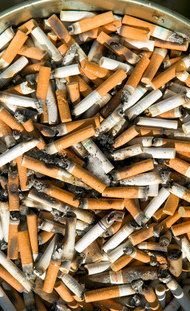 When smokers try to cut back or quit, the absence of nicotine leads to withdrawal symptoms. Withdrawal is both physical and psychological. Physically, the body is reacting to the absence of nicotine. Psychologically, the smoker is faced with giving up a habit, which is a major change in behavior. Both must be dealt with if quitting is to be successful. These uncomfortable symptoms lead the smoker to again start smoking cigarettes to boost blood levels of nicotine back to a level where there are no symptoms. If a person has smoked regularly for a few weeks or longer and abruptly stops using tobacco or greatly reduces the amount smoked, withdrawal symptoms will occur. Symptoms usually start within a few hours of the last cigarette and peak about 2 to 3 days later. Withdrawal symptoms can last for a few days to several weeks. For information on coping with withdrawal, see the section on "How to Quit."